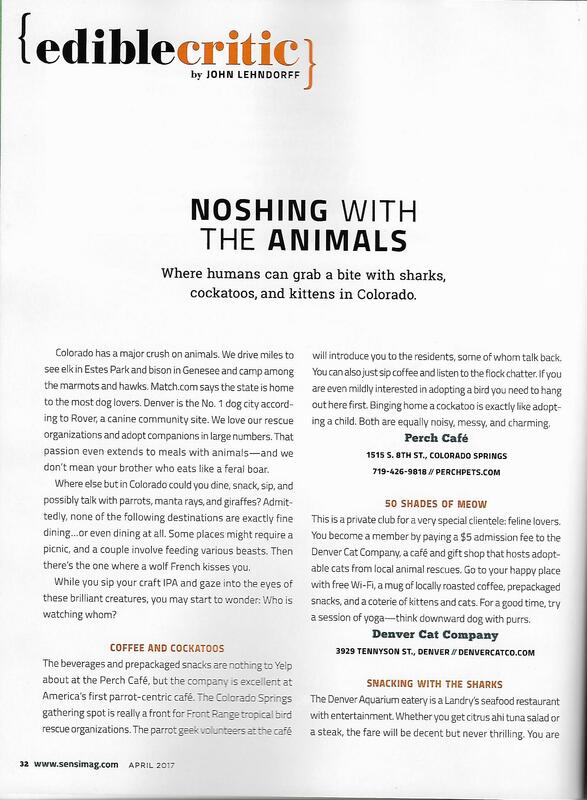 This Edible Critic column appears in the April 2017 issue of Sensi magazine) Colorado has a major crush on animals. We drive miles to see elk in Estes Park and bison in Genesee and camp among the marmots and hawks. Match.com says the state is home to the most dog lovers. Denver is the No. 1 dog city according to Rover, a canine community site. We love our rescue organizations and adopt companions in large numbers. That passion even extends to meal with animals (and we don’t mean your brother who eats like a feral boar).here else but in Colorado could you dine, snack, sip and possibly talk with parrots, manta rays and giraffes? Admittedly, none of the following destinations are exactly fine dining … or even dining at all. Some places might require a picnic and a couple involve feeding various beasts. Then there’s the one where a wolf French kisses you. While you sip your craft IPA and gaze into the eyes of these brilliant creatures you may start to wonder: Who is watching whom? The beverages and pre-packaged snacks are nothing to Yelp about at the Perch Café, but the company is excellent America’s first parrot-centric café. The Colorado Springs gathering spot is really a front for Front Range tropical bird rescue organizations. The parrot geek volunteers at the café will introduce you to the residents, some of whom talk back. You can also just sip coffee and listen to the flock chatter. If you are even mildly interested in adopting a bird you need to hang out here first. Binging home a cockatoo is exactly like adopting a child. Both are equally noisy, messy and charming. The Denver Aquarium eatery is a Landry’s seafood restaurant with entertainment. Whether you get citrus ahi tuna salad or a steak, the fare will be decent but never thrilling. You are there for the 100 or so species of fish living in a 50,000 gallon floor-to-ceiling tank and, more specifically, the sharks. The tank gets more exciting during the twice-daily feedings by divers and catches the attention of diners often with children diving into a Fisherman’s Platter heaped with a lobster tail, grilled and stuffed shrimp, scallops, tilapia and stuffed crab. Luckily, the Aquarium is not for kids only. Adults can zone out and get tanked at the Dive Lounge where they can see the sea life and the Mystic Mermaids from a safe distance. Entering JJ Chinese is just like the Denver Aquarium: You walk past tanks containing all manner of sea life both swimming and crawling. The only difference is that the kids can pick out which species they want to eat wok-fried. Sure, this destination is not for the squeamish, but eat here to taste truly fresh seafood. The menu of authentic Cantonese dishes includes steamed eel with black bean sauce, the sea cucumber hot pot and incredibly tasty lobster with ginger and green onion. Beer, cider and spirits tasting rooms are Colorado’s new living rooms where dogs can socialize while their humans drink and eat. Situated in a former Sonic Drive In, Lafayette’s Romero’s Dog Bar takes the canine sensibility to a new level. Draft and canned craft beers are available in the inside bar for humans. The brews can be quaffed on the enclosed deck with canines on-leash. The outdoor garden only allows nice puppies to be off-leash if their humans pre-register them and purchase a daily, monthly or yearly pass. For the hungry, there are often food trucks parked outside. Romero’s is only a bone’s-throw from great ethnic takeout food at Panang Thai, Udon Kaisha, Pho Café, Ras Kassa’s Ethiopian and El Mercado’s Taco Wagon. This is a private club for a very special clientele, feline lovers. You become a member by paying a $5 admission fee to the Denver Cat Company, a café and gift shop that hosts adoptable cats from local animal rescues. Go to your happy place with free wi-fi, a mug of locally roasted coffee, pre-packaged snacks and a coterie of kittens and cats. For a good time, try a session of yoga – think downward dog with purrs. The snackbar features chips, cookies, coffee and tea. However, the Colorado Wolf and Wildlife Center’s most unusual taste sensation is only available on the special Alpha Interactive Tour where you meet wolves up close and personal. How personal? Well, wolves like to greet you by licking the inside of your mouth. If you let them check you out, they will pay more attention to you. You may want to skip that rare burger right before the tour. Also, don’t wear leather or fur or dress like prey. The center in Divide two hours from Denver also offers hands’-off tours and yes, weddings with wolves. The Full Moon Feeding Tour allows you to observe wolf dining etiquette … or the lack thereof. Howling is encouraged. One of the coolest, only-in-Colorado picnic spots for animal lovers is at this unique zoo improbably but beautifully situated on the side of Cheyenne Mountain. There are outdoor spots throughout the zoo and sources for Nutella crepes such as Elson’s Place located close to the lions’ den (and living room). The Colorado Mountain Zoo boasts a cool menu of opportunities (for a fee) to feed snacks to giraffes, parrots, elephants and a rhino. There are few images more incongruous than seeing a gaggle of alligators basking in the sun with the San Juan Mountains as a backdrop. This animal attraction exists because the on-premise, geothermally fed fish farm needed a way to get rid of leftover fish. You may want to buy some excellent fresh tilapia and catfish to take to your campsite to fry or bake. Your appetite may be lessened because the place reeks of dead fish. You can buy alligator feed to encourage the gators to do something. You can also take an alligator wrestling class. Unlike with other predators, you do not want a large reptile to French kiss you. 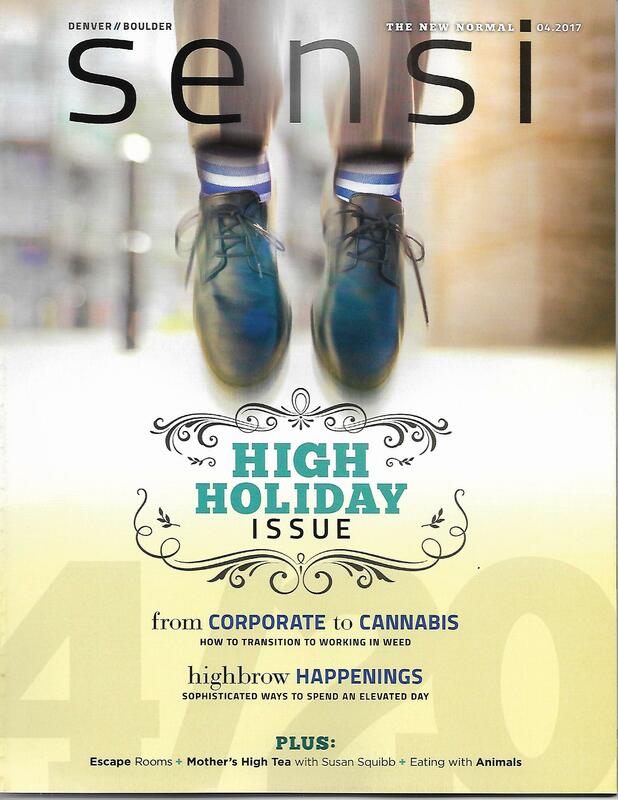 Tags: Colorado, Sensi Magazine. Bookmark the permalink.